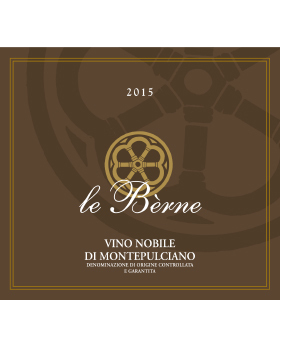 Founded in the late 1960s by Agostino Natalini in the Cervognano area, Le Berne covers approximately 21 hectares of land, of which 10 hectares are planted to vines & 3 hectares are devoted to olive groves. A clone of Sangiovese known by the locals in Montepulciano as Blackthorn -or- Prugnolo Gentile is the main varietal, with small amounts of indigenous Tuscan varietals such as Colorino & Mammolo used for blending. The ancient soils here are of Pliocene origin, containing many shells & stones. Their Riserva is comprised of mostly old vine fruit, with some vines up to 60 years old. The name Berne is derived from a late Etruscan/Latin term meaning hilltop. It is also worth noting Agostino’s son (Andrea) has been the President of the Consorzio del Vino Nobile di Montepulciano since 2012.